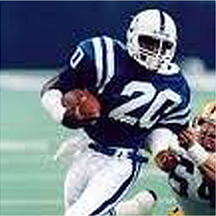 Albert Bentley was a former walk-on at the University of Miami who eventually earned a scholarship as a running back. He went on to become a major force in the Hurricane’s running game and scored the winning touchdown in the National Championship game against Nebraska in the 1983 Orange Bowl. He played eight seasons in the NFL, 7 with the Colts and his final year with the Steelers.